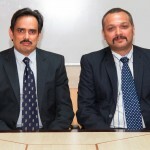 Balu and Kiran Co-Founded Ramyam Intelligence Lab (www.ramyamlab.com) Balu was with DRDO for more than 10 years until 1997. He managed couple of startups before he started his own. Post DRDO, Balu worked with Ushacomm for almost a year and an opportunity came to associate with a services startup Paragon (later acquired by FCG and now part of CSC) in 1998 as the day one employee. In his 5+ years at Paragon, he saw the company grow to 350 plus people with multiple offshore development centers created for global customers across verticals. Later he joined a product startup Xalted Information Systems, which was into Telecom products. Kiran is associated with Balu from his previous three companies. The two of them often spoke about doing something on their own but wanted the space to be unique. They found that the service providers like telecom, retailers and banks were spending millions of dollars to automate their processes but none of the technology initiatives allowed them to understand individual customers fully and hence the engagement between the companies and customers were at an abstract level only and companies were not getting the return on their investment on the money spent on technology. The customer engagement is always reactive and there was no continuous engagement. The way of engagement with the customers is still mainly segmentized promotions based on profession, age group, income etc and the services firms bombard the customers with a standard marketing message in-spite of the fact that two people in the same income group and in the same age group will need different things as they are two different people. The services entities were unable to understand what the individual customers wanted because of the enormous customer data that is accumulated within the system, which they were unable to use and take decisions on. Balu also realized that even though these companies do surveys, the response depends on the mood that the customers are in at that point in time and it is not based on the continuous experience throughout the lifecycle and does not necessarily give the correct picture of the customers’ experience. Balu said that there are no established enterprise level CEM providers. The three dimensions 1) Information that is filled in the customer forms when the customers sign into the service. 2) Transactional data that the customers generate while using the products/services of the business like how many local, STD, ISD calls are made, how much data is generated, what time of the day do they call, who do they call the most etc,. 3) Interactions that the customers do with the business. For example enabling services, paying for the services, complaints and feedback. Balu and Kiran decided to take the three historical data from all the heterogeneous systems in the services firm and gather data and model customer profile based on their behavior. They came up with certain use cases to provide actionable analytics. They began building a product and understood that this is not an application or a solution but an enterprise product because this sits above all the enterprise systems and gathers all sorts of data to derive information related to each customer even if they have millions of customers. The technology they developed is patent pending both in India and USA. They reached out to a few known prospects in the Telco and in the Banking space and began showing the demonstrations. They explained that the service experience level goes high which makes the customers to be more loyal thereby reducing the churn and this will create new revenue streams. Their value proposition of an addition of even one rupee out of the 100s of Millions of customers by using this actionable data for each customer resonated very well with the prospects on the Return on Investment in addition to knowing their customers well. Balu recalls that the first few sales were tough. Getting to educate the customers on the entire theme of Customer Experience Management was tough. Even today, not many companies know the actual power of CEM even though research firms like Gartner, Forrester, Deloitte, Frost & Sullivan etc., have begun comparing CEM to how CRM and ERP evolved during past decades. They had their first customer coming from Africa. They had partnered with a large firm, System Integrator for Telcos and they demonstrated the product and did an analysis of their existing customer engagements, did a Pilot and closed the deal. They reach out to customers using a combination of direct sales , System Integrators and geographically located partners. To begin with, the existing contacts in Telcos were pursued. They have a sales team that does a lot of cold calling into the Indian market focusing on the Brick & Mortar and e-commerce companies in Retail. Their strategy to be associated with large System Integrators to take them to enterprise customers across geographies is resulting in major closures. Their buyer persona is the Marketing department and would always reach out to them first to do the initial selling. After identifying their needs and articulating the value proposition, the IT teams do the due diligence of the product. Balu recollects a sales situation in the US with a large retail outlet. They found out that one of the major the retail chain had an issue of customers walking into the shops and feeling the products but go on to buy the products in online because the prices are low there and the were unable to convert their visitors into customers. They did a pilot to convert the footprints into sales through dynamic pricing seeing an increased sales. The sales process begins with cold calls followed by sending generic flyers. In the meetings, they speak about the multiple use cases and they understood the needs of the prospects and engage the prospect. The subsequent meetings will be to configure the product to solve the problems of the prospects and to do a PoC if required and close the deal. The prospects liked the product but could not take a decision to empanel a smaller company as a new vendor and hence asked them to come in through their existing vendors. The prospects also connected them with those large vendors and Ramyam Lab got good partners. The major convincing point in closing the sale was taking the customer data and showing how their data looks like. However, the customer data was very sensitive and hence the prospects took more than 2 to 3 months’ time to mask all the names, addresses. Balu used the effectiveness dashboard to the CxOs to provide statistics on the actions and ROI compared to the current scheme as total effectiveness which got them the go ahead (If you can explain how you still succeeded against these limitations from a sales point of view). Because of the uniqueness of the powerful solution, they also got lots of references. Balu’s Advice to early stage entrepreneurs – Be ready to accept changes because Change is Inevitable. As a Technopreneur – be focused on the business benefits rather than getting wedded to technology. The first shock will come to you when you give your demo because this will put your version of the benefits of the ideal world using your product to be totally different from what the market wants. You have to be flexible to make changes as per the market needs to succeed. Ramyam Intelligence Lab today has around 85 employees and has CEM solutions in Retail, Telco, Healthcare and e-commerce. They have the top customers in almost all these domains. They are associated with the large IT companies for system integration and offering specific solutions in CEM area. They have won the “Amulya” appreciation Certification from Karnataka state innovation council for their patent. Frost & Sullivan and NASSCOM featured them in the product excellence matrix in 2013 as Dark Horses in Analytics and moved them into the fourth quadrant (top) in 2014 as ‘Exemplers’. Deloitte positioned Enliven CEM as emerging trend in BPM 2020 and wrote a 2 page case report about them. Forrester has rated them as one of the Top 10 Hot Emerging Indian Business Technology Vendors in 2015. Silicon India magazine recognized Ramyam as “CEM Company of the Year 2015”. Ramyam is seed funded and are looking out for funding now.